After my last post about eating more greens, the comments were clear, you want a smoothie post! I'll get one up in the next few days. 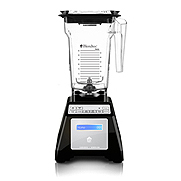 And, to get ready for all that blending, thought you might be interested in knowing that Blendtec is offering a Valentine's promotion, starting Monday January 31st and running thru February 8th. Hi wonderful creator of a fabulous recipe book! I just wanted to thank you for your Eat, Drink and Be Vegan cookbook. I got it for Christmas and have made dozens of recipes from it, each one tasting incredible and even my (meat, dairy-eating) hubby has loved 'em! You're eats are amazing, and I wish I could buy a copy of your book for everyone I know! Thanks for the Blendtec discount - I've been wanting one for a while and this was just enough savings to motivate me to buy!